Dedicated to the children of migrants | Walk with us! This morning Fr. Rino, SCJ, and Br. Bat, SCJ, and I headed off by taxi to visit Huong Tam School. It is about an hour from here depending on traffic. It is a social project close to the heart of any Dehonian and one the US Province adopted about 10 years ago. On the far right of the picture partially hidden by the bush (top of page) is Fr. Paul Tong. 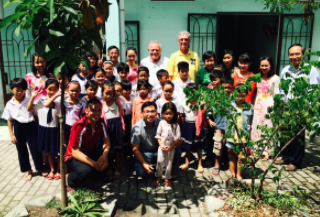 He is pastor of St. Paul parish, which founded Huong Tam School for Migrant Children. The congregation became aware of the school and its needs when SCJs began doing their pastoral year with him at the parish. In fact, Br. Bat has just begun his year at St. Paul’s. Huong Tam serves the needs of the children of migrants from the north who come to Ho Chi Minh City looking for work. They are not able to pay the fees for public school and without Huong Tam the students could not afford to be in school. At present it is located in a factory area renting five or six small rooms that house 40 to 48 children in each room. Over the course of the year a few students drop out either because their family has moved because of lack of work, or in a few cases, the students are old enough to drop out of school to go to work to help support their families. Unfortunately for me the school already let out for the summer but the staff were able to round up a few volunteer students who sang a song or two for us and seemed to be enjoying themselves. I don’t think the promise of a free lunch hurt the attendance figures any. Fr. Rino and I were enlisted to help pass out the snack and soda to our eager young recipients. We were told by the staff that the majority of students do well on their state exams. Vietnam has a system of yearly qualifying exams to pass from one grade to the next. Although this is a private school it has to meet state standards and does receive state inspection. While all that is true, the physical layout of the school leaves much to be desired. The rooms are small and poorly ventilated — remember, this is a tropical climate. It is located right next to a factory so noise from it and its trucks and equipment create a distraction to learning. Fr. Paul was informed that a new location must be found by the 2016 school year as the owner needs the space for his own operations. The school has many needs from such simple things as notebooks and pens/pencils for the students (many come from families living on the margin with no money for such supplies) to blackboards, and fans to improve ventilation. Those are a few of the items mentioned in our long conversation that stick out in my mind. Getting salaries closer to what a public school teacher makes is also a great challenge. If I were to sum up my impression of Huong Tam School it accomplishes a great deal with very limited means. The staff (all women) are very dedicated to their task of teaching young minds who represent the future generation for their country. Sometimes I think many Americans tend to forget that investment in education is an investment in the future. 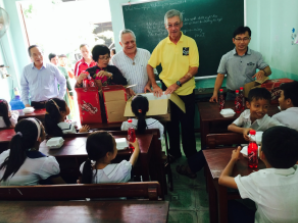 With help from the US Province and other funding sources our SCJ Vietnam District in serving the educational needs of over 200 boys and girls who otherwise might very well fall through the cracks of society. That investment is in keeping with our Dehonian Charism. Tomorrow morning I leave for Da Nang and won’t return to Ho Chi Minh City until June 10 so I may not have WiFi access until then, though I will continue to write my daily journal and pass them along when I can.